Locals of the town of Kiryat Yam have been congregating on the coast in the hopes of seeing one of the most beautiful mythological creatures of the sea-a mermaid. My new found friend, Brad Scott over at New Zealand Paranormal recently did a hour-long interview with me which will apparently be broadcast on the night of 26th of August. For those who are interested you can catch this broadcast by listening to 783 AM Wellington Access Radio at 11 PM on a Wednesday night to be a show called NZPI Paranormal Radio, well worth tuning in to if you have an interest in the paranormal. Check it out you will find it well worth it. The Himalayas had their Yetis, while Canada's Sasquatch was known informally as "Bigfoot". And now, the Lindis Pass hill country may - or may not - have its "Big Ginge". 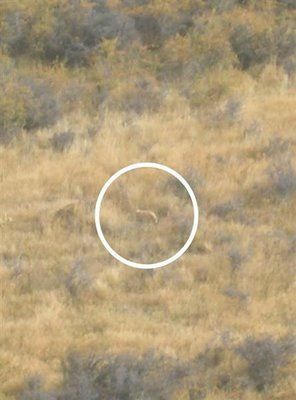 Scottish tourists Charlie and Marie Limond photographed what they described as a "lynx-sized mountain lion", at McLeays Creek in the Lindis Pass. "It was definitely way bigger than your domestic cat. About the size of an Alsatian dog," Mr Limond told the Otago Daily Times yesterday. This came hot off the press this morning, considering New Zealand only has small species of bats which are only seen in the forest and not capable of much damage to humans this case is definately a conundrum. There are reports of bats attacking two men in Rotorua. Taxi driver Ngaia Monaham says two men jumped in her car near Amohia Street just after 3.00am Monday. She says they told a bizarre story of being attacked and bitten by bats. Monaham says she did not believe them at first but than noticed they had bite marks on their arms. She says she and another taxi driver went back to Amohia Street with a torch and found hundreds of bats flying around in the trees. Man beasts and cave men in the 21st Century? Surely not. But a group of British explorers and scientists, backed by a renowned Geneticist from Oxford University, embark on an intrepid expedition into a war zone on Saturday, and they hope to come back with compelling evidence for the existence of such things. The yeti is one of the most iconic mystery animals in the world. Even in the 21st Century when mankind likes to think that it has conquered all the wild places of the planet, this hulking, hairy man beast still rears its ancient head and intrigues zoologists and explorers alike. I was recently contacted, via e-mail regarding a sighting of a possible Waitoreke in Gisbourne during the 1980s. The creature was 1.5 m long and displaying typical sea otter behavior by smashing shells on its chest. The sighting lasted a good 20 minutes with the creature about 10 m away showing total disregard for the witness. This will be one of the very rare North Island sightings of these wonderful creatures. Even more unusual is sighting took place at sea, most Waitoreke sightings are in areas of freshwater. Hawke's Bay Newspaper today reported that Rex Gilroy is to mount an expedition next month to find the moa and the ranges behind Wairoa. Mr Gilroy claims to have proof of up to 12 little Bush moa inhabiting a valley in the area. After some investigation I have found out that the Emu in the area and perhaps these have been mistaken for moa. With all the work carried out in the area, this is a department of conservation training area as well as used for logging and by other environmental groups, if anything have shown up it would have definitely been reported long ago. It will be interesting to see the results of Mr Gilroy's expedition. Apparently Australian Cryptozoologist Rex and Heather Gilroy who run the Australasian Cryptozoological Research Centre are finalising claims for an expedition to New Zealand. This is to take place in November to explore the Fiordland wilderness for traces of possible living Moa. Gilroy has led expeditions before and hinted at possible traces of living Moa in the Urewera Rangers. A member of trademe put up the sale supposed pictures of footprints and photographs of a live Moa. Without being able to verify the photographs it is hard to tell whether these are genuine or faked. The person putting up the photographs was mainly interested in the money for the rights to the photographs, regrettably this often cast suspicion and doubt about the veracity. The photographs and rights sold for $365. Follow up investigation in progress. After investigation I have found there were reports of Spoonbills in the Auckland area around the time of the sighting, this is a possibilty for the sighting reported. However, I am awaiting more information. "Elementum Bestia" is now available via the net in PDF format and in black and white or Colour hard cover. It has a small section on New Zealand Cryptids. A very comprehensive work that covers alot on Cryptozoology.